Two overly imaginative pranksters named George and Harold hypnotize their principal into thinking he's a ridiculously enthusiastic, incredibly dimwitted superhero named Captain Underpants. 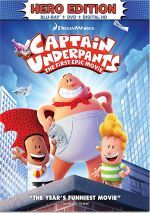 20 years after the launch of the children’s book franchise, 2017 brings the goofy superhero’s cinematic debut via Captain Underpants: The First Epic Movie. Nine-year-old best buddies George (voiced by Kevin Hart) and Harold (Thomas Middleditch) boast active imaginations, and they channel their creative energy into comic books about “Captain Underpants”. George and Harold tend toward prankster ways as well, and these cause them to run afoul of Principal Krupp (Ed Helms), a mean man who hates all forms of fun. The boys find a twist when they hypnotize him into the belief that Krupp is actually Captain Underpants. We follow various misadventures as George and Harold try to use this happenstance for their own ends – and battle a nefarious new science teacher (Nick Kroll) along the way. Over the summer, I took my girlfriend’s four-year-old to see Underpants as his first-ever big screen movie. I did this partly because it seemed like something innocent and silly enough for a kid his age, but I also maintained ulterior motives. When we all watch TV, the boy wants to watch the crappiest crap you can imagine. With so much televised pain under my belt, I hoped to take him to a movie that he and I would both enjoy, so Underpants - the beneficiary of strong reviews – seemed like a good choice. The boy liked it – maybe not as much as I’d hoped, but he had a fun time. As did I, and not just for vicarious reasons - Underpants delivers a rollicking piece of entertainment, even for elderly folks like me. Actually, the creative and clever Underpants might work better for adults than kids – at least little kids. Some of the humor was over the four-year-old’s head, so while he enjoyed the goofier/sillier stuff, a lot of the material came across as a bit too “mature” for him – well, as “mature” as a cartoon about a fat hypnotized “hero” in tighty whities can be, I guess. Underpants genuinely has its comedic cake and eats it, too. To be sure, the film goes with lots of nutty kid-oriented comedy, but it steers toward a more sophisticated bent than one might expect. The film manages to poke fun at its genre and pack in witty, clever views of childhood and school life. An excellent cast helps. Both Hart and Middleditch imbue their similar roles with nice life, and Helms brings the necessary gruffness to Krupp along with the appropriate level of campy heroics as Underpants. Kroll’s Professor P offers a silly baddie with a wicked underbite. All of this leads to a brisk, delightful 89 minutes of animated comedy. I hope we get a second epic movie – and I’ll see it even if the kid doesn’t want to go! Stick around through the middle of the end credits for a little bonus clip. 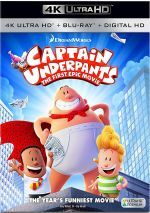 Captain Underpants: The First Epic Movie appears in an aspect ratio of approximately 1.85:1 on this Blu-ray Disc. As I expected, the transfer looked terrific. Sharpness was fine across the board. Virtually no softness appeared, as the movie delivered satisfying definition. No signs of jagged edges or moiré effects occurred, and edge haloes were absent. Of course, print flaws never manifested themselves. The film’s palette offered a general pastel tone, with a minor emphasis on orange and teal. The colors showed a good sense of vividness and worked well. Blacks were dark and deep, while low-light shots offered nice clarity and smoothness. This became an appealing visual presentation. With Underpants, we get a DTS-HD MA 7.1 soundtrack, and this mix offered a reasonably lively soundscape, especially during the action sequences. Those fleshed out the spectrum in an involving way and gave us good involvement for these cartoony spectacles. These traits kicked into higher gear as the movie progressed. While the film came with plenty of sonic action from its start, the climax got even crazier, and the various speakers added real kick to the proceedings. Audio quality seemed pleasing. Speech always sounded distinctive and concise, while music was peppy and rich. Effects offered solid reproduction, with clean highs and deep lows. I liked this mix and thought it gave the movie life. A slew of brief extras fill out the disc, and we begin with The Really Cool Adventures of Captain Underpants Motion Comic. 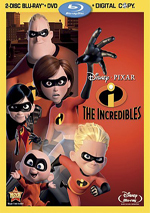 It runs two minutes, 52 seconds and shows a crudely animated version of a superhero story. It’s nothing great, but it’s fun, and it’s nice to hear actors Kevin Hart and Thomas Middleditch reprise their roles. Two similar clips follow: The Captain Underpants Guide to Being a Hero (3:51) and The Professor Poopypants (Totally Original and Supercool) Guide to Being a Villain (3:53). Both relate rules of being a hero or a villain. These seem cute and benefit from the use of actors Hart, Middleditch and Nick Kroll. Five Deleted Scenes last a total of 11 minutes. These come with introductions from director David Soren, as he tells us a little about the clips and why they didn’t make the cut. Presented as animatics, these offer some additional background for various characters and plot elements. They tend to be funny and entertaining additions. Two Lyric Videos follow. We get clips for “Captain Underpants” by Weird Al Yankovic (2:15) and “A Friend Like You” by Andy Grammer (3:45). The former shows movie clips along with the song, while the latter matches comic art with the tune. Neither stands out as memorable. Next we get two Q&As with the Stars. These fill a total of two minutes, four seconds and offer info from actors Kevin Hart, Ed Helms and Thomas Middleditch. They take fan questions like who they’d like to give a wedgie to or what superhero talents they boast. The clips seem mildly amusing and that’s about it. We get more from Hart and Helms via the two-minute, seven-second Kevin Hart and Ed Helms Surprise the Fans. The actors talk to a few kids in this fluffy promo piece. Lunch Lady PSA goes for one minute, two seconds and features actor Kristen Schaal. She offers a faux-serious discussion of the sad plight of the lunch lady. It’s another mildly cute clip. With Sock Puppets, Real Stars, we get a 27-second promo piece. Hart and Middleditch voice sock puppet versions of their characters in another generally likable advertisement. A Gallery breaks into two areas. We find Comic Book Covers (8 images) and The Art of Captain Underpants (22). Both offer a nice array of drawings. The disc opens with ads for The Boss Baby, Diary of a Wimpy Kid: The Long Haul, and various DreamWorks TV series. Sneak Peek adds promos for Despicable Me 3 and The Nut Job 2: Nutty By Nature. We also find the trailer for Underpants along with The World of DreamWorks Animation. There we find various promotional elements related to Shrek, Madagascar, How to Train Your Dragon, Kung Fu Panda, The Croods, Turbo and Home. Mostly we get music videos, but a few trailers appear as well. A second disc provides a DVD copy of Underpants. It includes the same extras as the Blu-ray.